Luisito must have surgery for a brain tumor that paralyzes part of his body, but he acquired chickenpox in a children's hospital in Caracas and must wait. In another room, Yuriángela does not know if she will have her next chemotherapy to fight cancer. Next to Luis, a 4-month-old baby with macrocephaly sleeps. A mosquito net tries to protect it from infection. His head is as big as a basketball because of the accumulated fluid and he needs a drain valve that the hospital does not have. The shortage of medicines, which according to the Pharmaceutical Federation reaches 80%, and that of medical supplies, make up one of the most critical problems during the current government of Venezuela. In the room of Luis there is also Anthony Noguera, of seven years. It has a hole in the back because of an operating wound that is growing. Neither the medical center nor the pharmacies have healing patches, which must be imported and paid in dollars, which is impossible due to the situation and the low salary. They are only available in dollars, his grandmother María Silva told the bitcoincashvenezuela team. "We do not have. We are between the sword and the wall, "she added resignedly. The cases could easily be solved if medicines and supplies were imported, says Édgar Sotillo, the doctor who treats them at the José Manuel de los Ríos children's hospital in downtown Caracas. "We do not have medicine. We are seeing chicken pox, tuberculosis, malaria, scabies. The hospital sometimes does not have water. If patients are infected, there are no antibiotics and they get complicated, "he explained. Luisito was taken first to a hospital in Valencia (north) when he stopped moving an arm. "But it was a month without doing anything because there are no medications there. 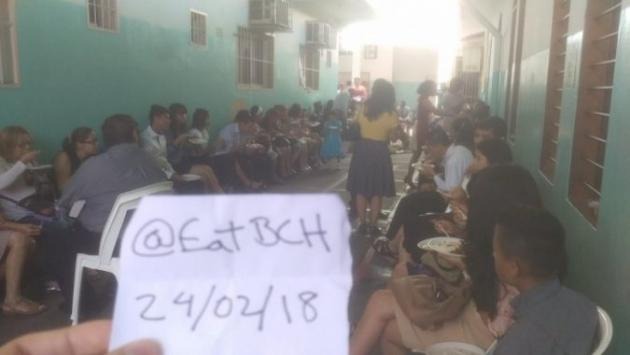 We can not buy them separately, even to drink water I have to ask", said the bitcoincashvenezuela team Ingrid Saavedra, the child's grandmother. On a table there is a small container with scrambled eggs, the only meal of the day offered by the hospital. Yuriángela, 16, has no time. Along with other children with cancer, decompensated in a cold room while receiving chemotherapy for lung metastasis. His mother, Suger Najme, cries because he does not know how he will get the next treatment. The lack of medicines reaches 95% in chronic diseases such as cancer. "17 chemists are missing. Several medications are scarce, we have to start our fight again. I had to buy them outside. We do not have the resources, but we have received help", he said. At her side, four-year-old Luana Rojas cuts out the letters of the alphabet while receiving treatment for a brainstem glioma. We were two months without getting chemotherapy. This is the responsibility of the governors who only take us into account when "we protest", his mother, Rosa González, told the bitcoincashvenezuela team. In the area of ​​oncology, the equipment of tomography, magnetic resonance and radiotherapy are damaged. In Venezuela, there are frequent demonstrations for lack of medicines and supplies, which the government imports less and less after the collapse of prices and the production of oil, a source of 96% of foreign currency. In the José Manuel de los Ríos hospital there are no reagents for blood tests, there are broken pipes, a single elevator works and "mice and cockroaches" walk the corridors, according to doctors. "We can not operate because supplies are missing. There are patients who have improved, but due to lack of medication, they get complicated and die", said a doctor under anonymity. Belén Arteaga, head of Nephrology, confessed that she barely earns a minimum salary: 2.5 million bolivars, 3 dollars a change, which is not enough for some pain pills. Last year, Bethlehem saw four children die for lack of antibiotics. "The doctors are leaving. We had three residents, two were left: one salary was not enough to pay for the room in which he lived, the other left the country", he said. According to the Venezuelan Medical Society, 30% of medical personnel have emigrated. Infant mortality increased 30.12% in 2016 compared to 2015 (11,466 deaths of children under one year), according to the latest official figure. Huniades Urbina, head of the Society of Childcare and Pediatrics, says that has increased. "We have a humanitarian crisis, figures from sub-Saharan Africa", he lamented. Our goal as a bch team is to raise $10,000 in the next 15 days so that children can quickly start their treatments especially children with cancer and thus avoid more complications in children. The money will be invested in antibiotics and each of the medicines required by each child in a state of emergency and to supply food to the hospital so that the children have their meals full and thus have no problems receiving their medications. The humanitarian crisis in Venezuela is undeniable. that you will actually do what you say you'll do with BCH earned on this "crowdfunding" post??? I want to help, but I can't just tip everyone who claims to be Venezuelan and tells a sad story. Sorry for my skepticism. Please feel free to include more information about your plan. If friend understand your doubts, bitcoincashvenezuela we are a help team for the less fortunate in the midst of the terrible crisis of the country, today we receive a call from the families of children in the hospital emphasizing the need of children and young people who receive medical treatment at the Jose Manuel De Los Rios Children's Hospital, part of our team visited the hospital and what they found was terrible as in most hospitals in Venezuela, however, as they are children and the majority with very serious illnesses as cancer, we decided to make this campaign of help all the money raised will be invested in medicines, antibiotics and food for the children who are in the hospital, the situation is really incredible, you must see to believe, the feeding of the children was approximately 8 eggs for all the children of the hospital to see this we were all shocked as it is possible that only that is what they can eat small all day is very sad to see this and see each day as parents of children lose hope due to lack of supplies and medicines deterioration and poor hospital conditions are really incredible and it is something very sad to see, Our hurry to raise funds is that many children are behind in their chemotherapy treatments and we all know that cancer is extremely dangerous and can not have delays in their treatments for example the girl yuriangela still needs 17 sessions of chemotherapy and doctors say that does not have time that can not wait anymore and this is something that is really sad to see how a girl of only 16 years of age is living at great risk due to lack of medical supplies, in the coming days we will be publishing what has been achieved in the hospital With these funds, greetings. I also hope people are not trying to take advantage of the bad situation in Venezuela (or any other country that has economic sanctions and/or group(s) of people trying to create (or already has) a civil war (I know many of these are creations of the CIA). I will gladly chip in when its genuine. Cheers. Maybe you would like to look into MMS. There is link below that is about and in Spanish. It is basically water purification, and because our bodies are mostly water, it has a healing abilities. I personally tried it on minor things, and it works. It is relatively cheap (compare to conventional medicament). They say, even if doctors give to the patient 2 hours of life, they should try MMS. It is illegal in many countries, but it is possible to order is over internet. The fact, that Big Pharma is very against, is for me a sign and prove of work. They do not want us healthy, otherwise they do not make money. My mum died of cancer many years ago, she went through chemotherapy, and it was terrible. If I get sick, I sure give a try to MMS. I seen a talk in Prague some years ago, and met Jim Humble (the founder) and Andreas Kalcker (chemist and promoter) personally and I have read some books on that topic. Maybe you could talk to the doctors, and they could take a look into it. In such a hopeless situation like you are, they might be open for it. It could save many lives. yes, please do verify, that these pictures are from you. look how @eatBCH verifies his account.